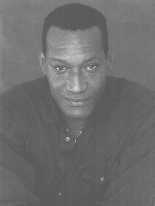 Author's Note: Tony Todd is one of the hardest working actors around these days. He is as noted for his appearances in face- obscuring makeup as he is for those he is more "himself". 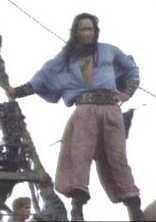 XENA fans know him best as Cecrops, but his acting history is rich and varied. Generally he is more easily recognised as the CANDYMAN (from the horror film of that name) but STAR TREK fans (both NEXT GENERATION and VOYAGER ) will have seen him as a Klingon or an alien "Hunter". In any case, few people put as much energy into a performance, and Mr. Todd was gracious enough to expend a little of that energy in June of 1998 for the following conversation. It's a pleasure to speak to you, Mr. Todd, thanks for calling. I was looking at your background here and a couple of things really jumped out at me. I see that you were a Boy Scout when you were a young man. I was too. I find that very interesting. It's one of those things that colleagues sometimes give you a hard time about, but for me, I had some of the most positive and affirming experiences in my life as a Boy Scout. It helped shape my life. Absolutely. It gave me direction at a time when you have a choice of either belonging to a group of peers that were up to destructive behaviour, or, as you said, shape your life. It literally molded me and set me in the direction of public speaking, which led to acting. What rank did you make? I went up to "Star". [note: two short of "Eagle, the highest ranking for Scouts] Yourself? I got three merit badges shy of "Eagle", I was "Life". I actually went to one of the World Jamborees, which was a high point for me at the time. It was my first overseas travel. The total camping experience was great. ...stories and cooking. It's wonderful, it's unbelievable. As a matter of fact I do camping with my family now. There's nothing like being out in the open air. It also encouraged a love of travel. A lot of actors don't like going on location. You'd be surprised how many people, when they hear New Zealand, say "Go on, get out of here!" It's a long trip, about 14 hours. I was down there recently, so I sympathise with that. But once you're down there, it's worth the trip. And the people on set there work very hard. They're a great crew. It's a well oiled machine, I gotta give them that. I like the autonomy they have. Being away from Hollywood there are fewer "executives" walking around. Rob Tapert totally trusts the people he's put into place there, and that's a good feeling. I just came back from my third time over and really enjoyed it. From what I've seen in your bio it seems like half the time you're on television you're buried in makeup and/or costume. You were a Klingon on STAR TREK:TNG and you played an alien creature in the VOYAGER episode PREY. I thought you did a spectacular job bringing that alien character to life. [laughs] Considering some fans thought it looked like I had a basketball on my head. STAR TREK was probably the first show that gave me access to the fan world, so I'm always grateful to them. My favourite of that was the VISITOR episode, did you see that one? Tony Todd didn't have to be buried under tons of makeup to play Cecrops. Yes! You played Jake Sisko all grown up. That was Emmy material. We got ignored, but I had a great time. It was a wonderful episode. Do you like the genre stuff? [smiles] I guess I must! [both laugh] I didn't wake up one day and try to become a part of the sci-fi/fantasy universe, but it seems to be heading that way. I can't spit a gift horse in the eye. When you're a Boy Scout, your motto is "Be Prepared", right? I'm getting ready to do BABYLON 5 starting tomorrow. I do it without prosthetics and I'm kind of happy about that. This is the second B5 TV film. I don't think it's going to come out until January. Apparently it's the prelude to the new series. Do you find that people are asking for you more now specifically, as opposed to having to go out and track down the work? They're asking for me more in a certain genre, yes. I'm constantly trying to make sure all my bases are covered, though. I do a lot of independent films playing more normal people. I have a healthy theatre background too and I'm doing a play this summer. I'm looking forward to that. That's why I'm booked until November, when I go back to New Zealand. What do you think of theatre versus television? Is there one you like better? In an ideal world, I'd just do theatre. I trained at Trinity Rep Conservatory in Providence. It's a wonderful theatre and school. That was the foundation. Unfortunately it's hard to make a living doing full theatre. I try to do a play a year. So far during the last five years I've been able to do that. It's honest work. It's more direct, more interactive. It's just real. You have a six week rehearsal period as opposed to television where you basically have to rehearse on your own. In TV you just show up and do it. In theatre you learn to put more time into the material before you show up on the set. I owe a lot in my Television work to my theatre background. Do you find in your stage work that you evolve a character over time, perhaps in response to audience reaction or perception? As far as your recent experience in New Zealand was that HERCULES or XENA? It was HERCULES, the season opener. I worked with Gina Torres. We played brother and sister in that episode. So you didn't play Cecrops in this case. No, this will be the third different character I've played for them. I know they intend to keep Cecrops and Gladius alive. I know they have stronger plans for Cecrops. Cecrops *may* be coming back in Season 4. Tell me about your New Zealand experience and your work on FAITH [HERCULES Season opener]. It was an interesting character. It's King Gilgamesh. I did a lot of research before I went down. There are so many different versions of who he was and what he did. One of the difficulties I had doing that character was that he was so unusual. Of the three characters I've done for those shows he's the most diabolical. It's a split character, really. One half is the king and the other half is an evil entity. That was fun to do. There was a lot of makeup involved in the second part. There's a Herculean battle in it too. Very cataclysmic. It was a very expensive episode. It also sets up a new arc for HERCULES. It will make for darker and more probing storylines, I think. I'm proud to be a part of that. I have to say, especially since they've got Paul Coyle on HERCULES full time, HERCULES has had some fine scripts this last season. It's a popular show, and I have two children who love it, so that's another motivation that I have. I like to do things my kids can watch. FAITH had six different locations and there was a lot of heavy stuff going on in that. There were sacrifices, condemnation of the gods, heroic deeds, people rescued, it's got everything. This is quite epic. Michael Hurst directed this episode. Kevin [Sorbo] is great. Were there any moments while doing that where you felt particularly satisfied as an actor? Any memorable scenes stand out for you? I remember when I first arrived I went through three different wardrobe fittings. Even in my film work I don't go through that much. There was a very specific look I needed for three different changes. I knew we were setting up for something quite spectacular. In the first day we shot seven pages of, for me, crucial stuff. Towards the end of that day there's this huge scene where I bring in this child from outside. The wind machines are going. My arms are falling off because the child is a teenager and fairly heavy. I had to do this speech to the people and they had this great assortment of extras who had the most incredible faces. They were truly listening to what I was saying, so I knew I must have been doing something right. At the end of it, they applauded, and that really made me feel good, because I communicated what I was trying to do. That set the tone for the whole thing. I knew I was on to something. The next couple of days I spent with Gina [Torres] being strapped down in front of me so... [both laugh]. That was fun. Well you've got good taste, I have to say that! Yeah! [both laugh] But shows like this appeal to the child in me, too. What teenager who's a Boy Scout would dream that one day they'd be toe to toe with some of the most mythological characters in modern history. So that's a cool thing, man. I notice in reading some of your bio stuff you liked to watch scary movies on TV at home late at night when you were growing up. Yeah, I was an only child. Well once again, I'm right there with you. I had the same experience. There was nothing like sitting up late at night to watch a Lon Chaney or Boris Karloff or Vincent Price or Peter Cushing flick. [thinks] It gave you a sense of courage. Yeah, it did! And also, I don't want to put words in your mouth or speak for you, you may agree or disagree, but it also gave you a sense of sympathy and identification with other characters, places, events, times, and so forth. When you spend a lot of time on your own you think a lot about things like that. Oh, yes. And then you sort of project it. I was a big comic book fan as well. I could amuse myself for hours with my comic books or models or black and white television. One of the greatest things as an adult is all the characters I've played are basically extensions of childhood role playing. This is from playing pirates or space monsters, cowboys, all these icons. I'm actually getting paid to do it now. That's a beautiful thing. That's really unbelievable. I'm 42 now, but I feel like I'm 29. It's directly because I enjoy what I do. I'm blessed. I still work with kids and I give it back as well. I taught as a schoolteacher for two years before I moved to New York. That was a challenging time in my life. I was fresh out of college myself. All of those categories are pretty lean when it comes to making a living. I never doubted that I was going to make a living. It never entered my mind that I wouldn't do it. Part of that was because of the professors and teachers I had. I was surrounded by a great group of peers who were very talented themselves. But it has a very high attrition rate. Out of twenty of us there are only about three who are working at acting. People get married, switch professions, whatever. A lot of them are teachers. I totally support my school, it's a great place. I haven't been back in about five years. I send them scripts and stuff I have access to. One day I will go back, and maybe I'll teach there. If I was a student, I'd want to listen to somebody that's been out there, as opposed to someone who's theorising about it. They don't teach you about the business side of it, for example. I imagine there's a lot to learn there. It's brutal. How to cope with constant rejection is brutal. For every role I get there's five I don't get. I was reading where you had to turn down an option with EARTH: FINAL CONFLICT for financial reasons. I couldn't accept it, and that was a shame because I really like the STAR TREK enterprise. They offered me the role but I couldn't afford to do it. Not only that, but they wanted to tie me up for six and a half years. I like to work but not every single day. I like being a guest star. If the right series came along at the right price I could settle down, but I have to consider my family too. Do you like the show? I love that show. I think it's a great show. The role I was offered was that of Sandoval. I had a hunch that was the case! And that reminds me of something else I wanted to ask about. Having had a little experience in show business years ago and seeing different production companies in action, Pacific Renaissance seems to be much more colourblind than most. I was interested in what you thought about that. As a Black actor, you have a much more distinct perspective. I think it's wonderful. Unfortunately, there is a lot of "colourfast" casting going on in the American system. Having trained classically when I was in school, we did everything. I had no idea I was going to hit a brick wall when I got out professionally and would be handed scripts for characters like "Slick" and so forth. Pacific Renaissance is great, because Cecrops *could* be played by a white actor. All of the roles I played for them could have been played by a white actor. Someone had the imagination to know that I might be the best person for the job. I applaud them for that. And the fans are not repulsed or anything like that. It's an open-ended world. With XENA particularly, I think part of her appeal. is that she reaches out to victims of oppression, be it people of sexual orientation or minorities of any kind. As does HERCULES for that matter. And STAR TREK does the same thing. Maybe that's why I tend to do more sci-fi. The realm of possibility is wide open. Being a Black American, and a successful Black American, I have access to a couple of different worlds here. I know both walks of life. I'm able to tap into that. Also I find sometimes my work is able to transcend racism in places I wouldn't expect. I did a mini- series in Austin, Texas. Austin itself is a great city, but Texas is still one of the great bastions of oppression. I've walked into redneck bars where there might have been a problem and somebody would say "Candyman!" All of a sudden it's OK.
 [laughs] That never fails to amuse me. I don't want to fall into that because I want to always be treated as a human being. So I always call people to task on that. I say "Would you like me if I wasn't?" It's interesting seeing the power of media. I applaud Renaissance for their open-ended, humanistic approach. 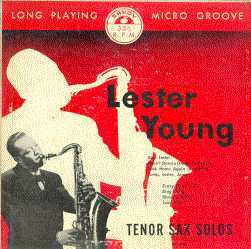 Lester Young was a preeminent Jazz musician. If you could create a project of your own, what would you like to make? Who would you like to be? I tend towards biographies. There are a lot of untold stories in American history I'd like to throw spotlights on. One of the things I've been toying with is a Lester Young biography. He was a saxophonist. He worked with Billie Holiday. I'd like to make Sam Cook's story. Things that are American triumphs, but characters that have ended up in disasters. Moments of triumph and why they dissolved. America is a very unique place in that you can blow up and spin out. I think film is powerful in that it can show lessons. As a kid, I learned all my morality from watching black and white films with my Aunt, who raised me. We could very clearly look at a story and say "That's the good guy, that's the bad guy. You want to be like the good guy, not the bad guy." Nowadays a lot of the films confuse those lines, with the emphasis on blowing things up. I saw VOLCANO for the first time, and I hated it. I really did. There was one scene in particular where a guy is going into the metro train and he has to walk through the fire. I just found that disgusting. It's amazing, we're almost approaching "Revelations" in our film work with all this disaster stuff. DEEP IMPACT made 41 million this weekend. That's kinda sad. In the old HAMMER films all you needed was the suggestion of what happened, with perhaps only one or two graphic scenes. For example, I went to see STARSHIP TROOPERS because I remember reading the book when I was a kid. It wasn't what you envisioned, was it? No, not at all. In the book I got much more of a sense of personal struggle, the futility and tragedy of war, people coming together and so forth. But the film was much, much more violent and graphic. It was relentless. The first time you saw the "bugs" it was great. But it was a constant bombardment. Less is more, man. THE BLOB is a good example of that. It was a very frightening movie at the time, because you could identify with life in the small town. I grew up in a small town. 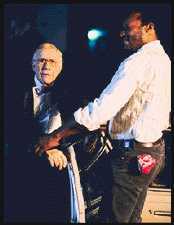 A still from DOG WALKER, showing John Randolph and Tony Todd. Do you have anything coming out soon yourself that you're enthusiastic about? There's an independent that I did called DOG WALKER. It hasn't come out yet, but it's some of my best work. I'm really proud of it. There's another film called DRIVEN which has gotten a small, limited release. I think it should soon get a video distribution deal. Both of those films were made for under a million but feature some of my strongest character work. DRIVEN is about a group of Los Angeles cab drivers trying to prove their life has value. It was written and directed by a guy named Michael Shoob. DOGWALKER follows a group of people on the fringes of society. My character is a heroin addict. He's a street guy, but he's kind of the mayor of the underworld. I have these great scenes with a character actor named John Randolph. He's great. He did a picture called SECONDS and was blacklisted for years. Sometimes some of the greatest things about my career is that I get to meet people I've seen or admired. I got to work with James Earl Jones twice. Those moments make my day. Both of those films are very good.